Welcome to Advanced Acupuncture & Oriental Medicine. For over 20 years, acupuncturist Rachel Toomim has been recognized as a distinguished leader, scholar and a results-oriented practitioner. As acknowledgement of her advanced acupuncture techniques and leadership skills, she received the Chief Justice Commendation from the Supreme Court of Florida and was elected to three national acupuncture boards. She teaches throughout the country and served as faculty for the University of Miami's School of Complementary & Alternative Medicine. Rachel Toomim A.P. is able to merge acupuncture theory with understandings from modern medicine to allow for better integration with treatment provided by your doctor and other practitioners. ☯ What happens during an acupuncture session? ☯ How many treatments will I need? 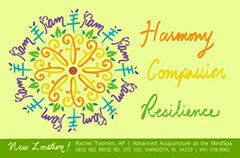 ☯ Do I have to be "sick" in order to get acupuncture? What about Wellness visits? ☯ Does insurance cover acupuncture? ☯ What do I need to do to prepare for my first visit? ☯ How will the treatment feel? ☯ What will the treatment cost? The initial ninety minute visit includes a full health history as well as the first treatment. The health history is a review of past health concerns, previous treatment, medications and any other contributing factors, as well as a physical exam. Given the systemic approach of Acupuncture and Oriental Medicine, this examination is thorough and involves a full inquiry into all health and wellness issues. After going over current concerns and past history, Dr. Toomim will take your pulses and look at your tongue. The pulses are done on the very same radial artery that your medical doctor uses to read your pulse. Based on all of the information from the health history review and the physical examinations, she will provide the first treatment. In Oriental Medicine, there are three pulse positions on the radial artery of the wrist, and pulses are palpated on both wrists. Each of these pulse positions relates to two of the acupuncture channel pathways and the internal organ that is connected to the pathway. These pulse readings take more into consideration that the speed of the heartbeat. There are 27 different qualities possible. For example, the blood vessel may feel tense like a drum skin, or tight like a guitar string. The various qualities of the pulses indicate the nature of any imbalance in the system, and the organ/pathway associated with that imbalance. A modern medical dictionary will list a similar number of pulse qualities and long-time practicing MD's will recognize them. Modern medicine does not use the various pulse qualities as health indicators – favoring objective data from laboratory testing. However, we are all aware of someone who has had multiple medical testing done, without getting the answers to the nature and/or cause of their health concern. The pulses will always indicate what is going on in the body, and where. We cannot get the kind of details that many modern tests offer. Pulse taking will not indicate indicators such as the red blood cell count, or the level of liver antibodies. However, the pulses will show what systems are out of balance from an Acupuncture and Oriental Medicine perspective. The tongue is also an indicator of the body's relative health and functioning. The tongue body, texture, coating and color are all taken into account. Different areas of the tongue relate to different internal organs. The assessment of the tongue, along with the pulses provides a clear picture of the current condition. Once we understand the nature of the imbalances, the treatment is designed to support bringing the body back into balance. Many conditions and symptoms may be completely relieved. Many of them will improve to some degree. With severe conditions, the results may be more about slowing the progression of the disease or alleviating some of the symptoms associated. All of this depends on the individual patient, the nature of their condition and how far it has progressed. Patients are often surprised at the powerful results of treatment, on conditions that they had assumed would be with them for life. Dr. Toomim's treatment philosophy is, "It may be my job to be in this acupuncture office, but your job is to be out in the world and living your life." Her treatment emphasis is to get the greatest results in the fewest visits possible. The number of treatments needed is based upon individual needs and the condition of each patient at the time that treatment is sought. Some conditions are easily and quickly relieved. Chronic conditions generally take longer to resolve. Each person arrives in their own particular state of health, and responds to treatment is individual as well. Dr. Toomim will have a better understanding of your ability to progress in treatment after evaluating the results of the first visit. The more information that you can provide about how the first treatment affected your condition, the better Dr. Toomim is able to assess the number and frequency of treatments to follow. In ancient China, people would get a "tune-up" treatment of acupuncture regularly, at least every season change in order to maintain health. In Oriental Medicine, there are considered to be five seasons, with late summer considered as a separate season. When general health and balance are present, tune-ups support long-term health and strengthen the immune system as well as all the organ systems. Depending upon your personal health goals, you may choose to have your tune-ups monthly, every six weeks, or with the change of seasons. For some, with high levels of stress in their lives or work situations, weekly is appropriate. In China, where cost is not a concern, patients often have treatment daily for a set number of treatments. If their condition persists, they will undergo further rounds of treatment. These may be in series of five, ten, fifteen or twenty treatments. The number of treatments would depend upon the severity and/or duration and progression of the condition. With busy lives to take into consideration, one treatment per week is the most common frequency. Occasionally it is valuable and necessary to increase that frequency. This would depend upon individual needs and results. Insurance coverage varies from policy to policy. There are more and more insurance companies providing coverage for acupuncture. Does my policy offer acupuncture coverage? Are there any limitations to that coverage? Do I have a co-pay? Is it different than my regular co-pay? Has my deductible been met, or is there a separate deductible applied for treatment modalities such as acupuncture? Download the patient forms from this website and fill them out thoroughly. Even though a particular question on the form doesn't seem like it relates to your condition – go ahead and mention it. Acupuncture and Oriental Medicine theories often connect conditions that seem unrelated. Bring your forms with you to the first visit. Please note all medications and supplements that you use. Wear loose, comfortable clothes. Many of the most powerful acupuncture points are in the areas between the elbows and hands, and between the knees and feet. Make sure those areas are accessible. If treatment is necessary on other points of the body, Dr. Toomim will let you know. After acupuncture, most people feel deeply relaxed. It has been described as feeling like awakening from a very deep nap – feeling extremely rested. Along with the deep sense of inner calm, there is commonly a feeling of mental clarity that continues throughout the day. The experience is one of feeling relaxed and alert at the same time. There may be a sensation of being energized. Often, there is no sensation on having an acupuncture needle inserted. An acupuncture needle is extremely fine. Their extremely fine gauge is similar in thickness to a cat's whisker. Sometimes there is a brief Qi sensation associated with the stimulation of an acupuncture point. Occasionally the pleasant flow of energy through the channels perceived. Often, patients fall asleep during the treatment. The 1 ½ Hour initial examination and treatment has a basic cost of $160. This includes the first treatment. Additional charges may apply for extended evaluation and/or treatment episodes, herbs and supplements. Follow-up visits generally take one hour. They include an evaluation of previous results, a re-evaluation of current conditions, as well as the treatment. The basic cost is $85 for each follow-up visit. Additional charges for extended evaluation and treatment episodes or modalities may apply. Rachel Toomim AP practices in an integrated setting with a group of colleagues who are recognized experts in their fields. The MindSpa Integrative Wellness Center is the setting for this diverse group of experienced practitioners, who are poised to support you in attaining and maintaining your personal optimal health and wellness. Working in an integrative setting has great advantages. In Dr. Toomim's experience, a multi-pronged approach can be the best way to support difficult health issues. Seeing the whole person, from a variety of perspectives allows for the creation of a wellness plan that supports physical, mental and emotional health from an in-depth holistic perspective. The Consortium of Academic Health Centers for Integrative Medicine defines Integrative Medicine as "the practice of medicine that reaffirms the importance of the relationship between practitioner and patient, focuses on the whole person, is informed by evidence, and makes use of all appropriate therapeutic approaches, healthcare professionals, and disciplines to achieve optimal heath and healing". Dr. Toomim, along with all her colleagues at the MindSpa Integrative Wellness center embrace these core principles.